Offering free breakfast service and free internet access to its guests, IDA Dechen Villa is located at a distance of 3 km from SNT Bus Station and Paljor Stadium. It is a 3 storey building housing 6 spacious rooms. These rooms are equipped with amenities like television, wardrobe, bottled drinking water, makeup mirror, tea/coffee maker, room heater and an attached bathroom with hot/cold running water. 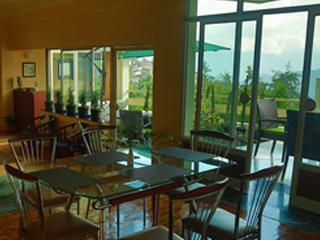 This property in Gangtok provides front desk assistance and travel counter facility to its guests. Breakfast Services, Travel Counter, Currency Exchange, Internet/Wi-Fi, Laundry Facilities, Security Guard, Restaurant, Parking, Room Service, Airport Transportation. Moisturiser, Wakeup Calls, House Keeping, Air Conditioning Room, Television Room, Bottled Water in Room, Cable/Satellite TV, H/C Water, Attached Bathroom, Iron/Ironing Board. User reviews for "Ida Dechen Villa Hotel Gangtok"